The selected candidates can also avail loan for purchase of Laptop to the maximum limit of Rs. 35,000/-, if the student wishes to do so. Actual cost of purchasing a laptop or Rs. 35,000/-, whichever is lower (in case the candidate is desirous of purchasing a laptop) will be financed as loan to the selected candidates. The relaxation in upper age limit to SC/ST/OBC candidates is allowed on cumulative basis with only one of the remaining categories for which age relaxation is permitted. Note : Definition of the above specified disabilities will be as per “THE RIGHTS OF PERSONS WITH DISABILITIES ACT, 2016”. Both the candidate as well as scribe will have to give a suitable undertaking confirming that the scribe fulfils all the stipulated eligibility criteria for a scribe mentioned above. Further in case it later transpires that he/she did not fulfil any laid down eligibility criteria or suppressed material facts the candidature of the applicant will stand cancelled, irrespective of the result. The scribe arranged by the candidate should not be a candidate for the online examination. If violation of the above is detected at any stage of the process, candidature of both the candidate and the scribe will be cancelled. Candidates eligible for and who wish to use the services of a scribe in the examination should invariably carefully indicate the same in the online application form. Any subsequent request may not be favourably entertained. Only candidates registered for compensatory time will be allowed such concessions since compensatory time given to candidates shall be system based, it shall not be possible to allow such time if he / she is not registered for the same. Candidates not registered for compensatory time shall not be allowed such concessions. Candidates are required to take a print of the e-receipt and online application. Online payment receipt will have to be produced, at the time of online test or interview, as the case may be. If the online transaction has not been successfully completed then the following message is displayed ‘Your online transaction was unsuccessful. Please register again.’ Candidates may then revisit the ‘Apply Online’ link and fill in their application details again. Without call letter and online payment receipt, the candidates will not be allowed to appear for online Test / Interview. After submitting your payment information in the online application form, please wait for the intimation from the server, DO NOT press Back or Refresh button in order to avoid double charges. Application once made will not be allowed to be withdrawn and fees once paid will NOT be refunded on any account nor can it be held in reserve for any other recruitment or selection process. The Final merit list for selection shall be arrived at on the basis of scores obtained by the candidates in Online test (objective + descriptive), Group Discussion and Interview. Individual Semester/Year wise Mark sheets & certificates for educational qualifications including the final degree/diploma certificate. Proper document from Board/ University for having declared the result on or before 02.07.2018 has to be submitted. In case of candidates belonging to OBC category, certificate should specifically contain a clause that the candidate does not belong to creamy layer section excluded from the benefits of reservation for Other Backward Classes in Civil post & services under Government of India. OBC caste certificate containing the Non-creamy layer clause should be valid as on the date of interview if called for (issued within one year as on the date of advertisement). Caste Name mentioned in certificate should tally letter by letter with Central Government list / notification. Disability certificate in prescribed format issued by the District Medical Board in case of Persons with Benchmark Disability category. If the candidate has used the services of a Scribe at the time of online examination, then the duly filled in details of the scribe in the prescribed format. An Ex-serviceman candidate has to produce a copy of the Service or Discharge Book along with pension payment order and documentary proof of rank last / presently held (substantive as well as acting) at the time of interview. Those who are still in defence service should submit a certificate from a competent authority that they will be relieved from defence services, on or before 02.07.2018. Persons eligible for age relaxation under “Persons ordinarily domiciled in the State of Jammu & Kashmir during the period 01.01.1980 to 31.12.1989” must produce the domicile certificate at the time of interview/ at any stage of the subsequent process from the District Jurisdiction where he / she had ordinarily resided or any other authority designated in this regard by the Government of Jammu & Kashmir to the effect that the candidate had ordinarily domiciled in the State of J&K during the period from 01.01.1980 to 31.12.1989. Persons eligible for age relaxation under “Persons affected by 1984 riots” must produce a certificate from the District Magistrate to the effect that they are eligible for relief in terms of the Rehabilitation Package for 1984 Riot Affected Persons sanctioned by the Government and communicated vide Ministry of Finance, Dept. of Financial Services communication No.F.No.9/21/2006-IR dated 27.07.2007. Candidates are required to have a valid personal email ID and Contact No. It should be kept active till completion of this selection process. Bank may send call letters for Online test, GD, interview, Offer of admission, etc. through the registered email ID. In case, a candidate does not have a valid personal email ID, he/she should create his/ her new email ID before applying Online. Under no circumstances, he/she should share/ mention email ID to/ or of any other person. After completing the procedure of applying on-line including payment of fees, the candidate should take a printout of the system generated on-line application form, ensure the particulars filled in are accurate and retain it along with Registration Number and Password for future reference. Print out of the same should NOT be sent to the Bank. Candidates are advised in their own interest to apply on-line much before the closing date and not to wait till the last date for depositing the fee to avoid the possibility of disconnection/ inability/ failure to log on to the Bank’s website on account of heavy load on internet/website jam. Bank does not assume any responsibility for the candidates not being able to submit their applications within the last date on account of the aforesaid reasons or for any other reason beyond the control of the Bank. The Centre, venue address, date and time for examination, GD and interview shall be intimated in the respective Call Letter. An eligible candidate should download his/her call letter from the Bank’s website www.bankofbaroda.com by entering his/ her details i.e. Registration Number and Password/Date of Birth. No hard copy of the call letter/Information Handout etc. will be sent by post/courier. Candidates are hence advised to regularly keep in touch with the authorized Bank website for details, updates and any information which may be posted for further guidance as well as to check their registered e-mail account from time to time during the recruitment process. Any request for change of centre, venue, date and time for examination, GD and interview shall not be entertained. If fingers are coated (stamped ink/mehandi/coloured/etc. ), ensure to thoroughly wash them so that coating is completely removed before the exam / interview / joining day. If the primary finger (right thumb) to be captured is injured/damaged, immediately notify the concerned authority in the test centre. In such cases impression of other fingers, toes etc. may be captured. Candidates are advised in their own interest not to bring any of the banned items including mobile phones/ pagers to the venue of the examination, as arrangement for safekeeping cannot be assured. Candidates are not permitted to use or have in possession calculators in examination premises. The name of the candidate or his/ her father/ husband etc. should be spelt correctly in the application as it appears in the certificates/ mark sheets. Any change/ alteration found may disqualify the candidature. A Candidate’s admission to the examination/ shortlisting for GD &/or interview and/ subsequent process is strictly provisional. The mere fact that the call letter(s)/ provisional allotment has been issued to the candidate does not imply that his/ her candidature has been finally cleared by Bank. Bank would be free to reject any application, at any stage of the process, cancel the candidature of the candidate in case it is detected at any stage that a candidate does not fulfill the eligibility norms and/or that he/she has furnished any incorrect/ false information/ certificate/documents or has suppressed any material fact(s). If candidature of any candidate is rejected for any reason according to the terms and conditions of this advertisement, no further representation in this regard will be entertained. Such decisions shall be final and binding on the candidate. If any of these shortcomings is/are detected after admission/appointment in Bank, his/her services are liable to be summarily terminated. Candidates will have to appear for the Online examination /GD/interview at their own expense. However, eligible outstation SC/ST/Persons with Benchmark Disabilities category candidates attending the interview will be reimbursed Second class to & fro railway/bus fare or actual expenses incurred, whichever is less, by shortest route on production of proof of travel (rail/bus ticket etc.). The above concession will not be admissible to SC/ST/Persons with Benchmark Disabilities category candidates who are already in service in Central / State Government, Corporations, Public Undertakings /Local Government, Institutions and Panchayats etc. The scribe arranged by the candidate should not be a candidate for the examination. If violation of the above is detected at any stage of the process, candidature of both the candidate and the scribe will be cancelled. The candidate will appear for the online examination/GD/interview at their own risks and the Bank will not be responsible for any injury/losses etc. of any nature. Online applications once registered will not be allowed to be withdrawn and/or the application fee/intimation charges once paid will not be refunded nor be held in reserve for any other examination. In case any dispute arises on account of interpretation of clauses in any version of this advertisement other than English, the English version available on Bank’s website shall prevail. A candidate should ensure that the signatures appended by him/her in all the places viz. in his/her call letter, attendance sheet etc. and in all correspondence with the bank in future should be identical and there should be no variation of any kind. The possibility of occurrence of some problem in the administration of the examination cannot be ruled out completely which may impact test delivery and/or result from being generated. In that event, every effort will be made to rectify such problem, which may include movement of candidates, delay in test. Conduct of a re-exam is at the absolute discretion of Bank. Candidates will not have any claim for a re-test. Candidates not willing to move or not willing to participate in the delayed process of test delivery shall be summarily rejected from the process. Bank shall not be responsible for any application made/ wrong information provided by an unauthorized person / institution. Candidates are advised not to share/ mention their application details with/to anyone. Admission of any candidate to the Baroda Manipal School of Banking, if declared successful in the selection process, is subject to his/her being declared medically fit by the Medical Officer approved by the Bank as per the requirements of the Bank. Bank reserves the right to change (modify/ add) any of the criteria, method of selection and provisional allotment etc. Intimations will be sent by email and / SMS only to the email ID and mobile number registered in the online application form. Bank shall not be responsible if the information/ intimations do not reach candidates in case of change in the mobile number, email address, technical fault or otherwise, beyond the control of Bank. Candidates are advised to keep a close watch on the authorized Bank’s website www.bankofbaroda.co.in for latest updates. Make sure that the picture is in colour, taken against a light coloured, preferably white background. Caps, hats and dark glasses are not acceptable, religious headwear is allowed but it must not cover your face. Size of the file should be between 20kb – 50kb. Ensure that the size of the scanned image is not more than 50kb. If the size of the file is more than 50kb, then adjust the settings of the scanner such as the DPI resolution, no of colours etc during the process of scanning. If the applicant’s signature on the answer script at the time of the examination does not match the signature on the Call letter, the applicant will be disqualified. Size of the file should be between 10kb – 20kb. Crop the image in the scanner to the edge of the photograph/ signature, then use the upload editor to crop the image to the final size (as specified above). The image file should be JPG or JPEG format. An example file name is: image01.jpg or image01.jpeg. Image dimensions can be checked by listing the folder files or moving the mouse over the file image icon. Candidates using MSWindows/ MSOffice can easily obtain photo and signature in .jpeg format not exceeding 50kb and 20kb respectively by using MSPaint or MSOffice Picture Manager. Scanned photograph and signature in any format can be saved in .jpg format by using ‘Save As’ option in the File menu and size can be reduced below 50kb (photograph) & 20kb (signature) by using crop and then resize option (Please see point (i) & (ii) above for the pixel size) in the ‘Image’ menu. Similar options are available in other photo editor also. Click on the respective link ‘Upload Photograph/ Signature”. The selected students will go through 9 (nine) months of on campus residential program at the Baroda Manipal School of Banking leading to award of a Post Graduate Certificate in Banking & Finance by Manipal University followed by a 3 (three) months work integrated learning (WIL) in the form of On the Job Training at any branch of Bank of Baroda leading to award of a Post-Graduate Diploma in Banking & Finance by Manipal university. The course is extendable to a further 18 months of blended learning which is optional at the option of the students and which will lead to award of MBA in Banking and Finance from Manipal University. The fees for this Course will be Rs. 3.45 lakhs (all inclusive Boarding, Lodging and course fees etc.) plus service taxes as applicable to be paid by the student from the year 2014-15 for batches joining after September 2014. However, students can finance the course fees by availing Education Loan which will be granted by Bank of Baroda at a concessional rate of interest of 8% interest. Students can therefore obtain a high quality specialized course in Banking and Finance without any monetary burden on them and fully financed by the Bank. The educational loan facilities are being made available to the participants taking into consideration that they are future employees of the Bank. As such, the concessional rates will be withdrawn, if the student does not join the Bank or stays with the Bank for certain number of years as stipulated, in which case, the Bank will levy the card rates as applicable, right from the inception itself. Apart from the above course fees, the exam fees for undergoing various certification exams viz. NISM (Mutual Funds) and NISM (Depository Opns.) as mandated under the course will have to be borne additionally by the candidates, as per the fees charged by NISM from time to time for conducting these certification exams. Currently, the fee for NISM (Mutual Funds) and NISM (depository Services) certification exams comes to Rs. 2500/- per candidate. A stipend amount will be paid to the students during the entire duration of the -9- months course of the Post Graduate Certificate in Banking & Finance Programme. Rs. 2,500/- during the nine months campus period. The fees amount will be reimbursed by Bank after completion of -05- years of service in the Bank. This is applicable for the students of upcoming batches (Batch 13 onwards) joining after September 2014. For 1st to 12th Batches, reimbursements will be made as enumerated in their offer letter or as modified from time to time. Bank of Baroda will give away prizes for the best students in the course. Bank of Baroda shall provide uniform and blazer to the students in line with common dress code and to ensure a specific uniform grooming for all participants. On successful completion of the course within the stipulated time period, the Bank would offer appointment as a Probationary Officer in JMG/S-I. At the time joining of Bank’s services, the candidate will have to execute a service Bond for serving a minimum of 3 years in the Bank w.e.f the date of their joining Bank’s service or else, shall pay back to the Bank the full amount of stipend received by him / her during the program, a notional amount of Rs. 1 lakh towards the cost of on-the –job training and also liquidate the entire Educational Loan outstanding at that point in time at the prevailing card rate from the date of availment. From the 3rd year onwards, any Officer leaving the Bank’s service will only have to clear his / her outstanding educational loan dues at applicable card rate. This condition is applicable to the candidates joining for BMSB from the selection exercise 2015-16 onwards. In case of candidates from 1st to 15th Batch (upto Selection exercise 2014-15), the period of service Bond will be 2 years. 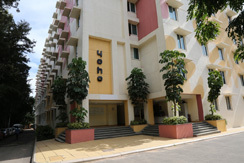 The programme offered at the Baroda Manipal School of Banking is fully residential and the participants would be necessarily staying in the campus. Apart from the professional studies, the campus life would be an essential part of training of the participants. A Doctor and clinic would be available at appointed hours in the campus for providing medical assistance to the students, as required. All students admitted to the course will be provided with a Participants Handbook which contains all the details of the Course Curriculum. Classes will be held five days a week from Monday to Friday with Saturday devoted to Project work, e-learning, Finacle practice, assignments etc. and Sunday being a weekly holiday. Apart from regular classes, the programme participants would be required to take part in additional curricular and extracurricular activities. Formal class room sessions will be of 65 minutes duration. There will be 7 sessions on each day. Programme delivery will be in the form of classroom lectures, tutorial discussions, seminars, laboratory work, assignments, case studies, library research projects and other exercises. Considerable emphasis will be placed on self learning by the participants. Co-curricular activities will form an essential part of the learning process. Saturdays will be devoted to Project Work, e-learning, Finacle practice, assignments etc. No. of sessions per subject per trimester – as per credits assigned. Note: Some of the sessions may be devoted to tests – both in trimester and end trimester. It is mandatory for all participants to attend 100% classes and also take part in all curricular and co-curricular activities. Leave of absence would be given only on extreme compassionate grounds with specific permission of the Dean, Baroda Manipal School of Banking. Lectures by experts from the Industry. Library service to include access to e-library. Access to e-learning modules of Bank of Baroda. Participants would be expected to work on various research projects during the course. The topic for the project would be assigned to them by the Institute. The participants would be expected to present the project to the institute during the course. He/she should have taken and passed in each subject of study as prescribed in the curriculum to earn the minimum number of credits specified for that particular subject. He/she would become eligible for the award of a diploma on acquiring 70 credits at the end of the programme. A system of continuous evaluation based on the Cumulative Grade Point Average (CGPA) system would be assessed based on their performance in the classes like tutorial discussions, seminars, presentations, assignments, surprise tests, viva voce, midsession examinations etc. This would be termed as internal assessment and would carry a weightage of 50%. The end trimester examinations would carry a weightage of 50%. Internal assessment of 50% would include Attendance, Class Participation, assignments, Mid Term Test, Surprise/Skill Tests Viva voce etc. (The above criteria for internal assessment may undergo changes from time to time, as decided by Baroda Manipal School of Banking, and these changes will be informed to the students through a notification displayed on the notice board). Appropriate letter grades are awarded in each theory and practical subjects to only such candidates who have passed in the university examinations. Internal assessment marks and University examination marks put together will be taken into account for the letter grading system in each subjects separately. A candidate registered for the university examination but who fails to score minimum required 60% marks in the University examination will get a grade F, indicating failure or grade incompletion. After the final term results (which includes OJT ) are declared, grade cards will be issued to each student, which will contain the list of subjects for all trimesters and the grades obtained by the student. GPA for each trimester will be calculated for those candidates who have passed all the subjects of that particular trimester of the course. The weighted average of the GPAs of all trimesters that the student has completed at any point of time is the Cumulative Grade Point Average (CGPA) at that point. CGPA up to any trimester will be calculated only for those students who have passed all the subjects upto that trimester. Generally CGPA is calculated after the successful completion of the entire PGDBF course. All students admitted to the course are provided with particular handbook and a copy of the discipline rules and regulations, which they have to abide by at all times during the programme. All students are required to sign a code of conduct prescribed by Baroda Manipal School of Banking. Any issue, not expressly provided herein, would rest at the absolute discretion of the BMSB authorities who also reserve the right to modify these instructions. It would be the earnest endeavor of the management to make the living conditions in the hostel as comfortable as possible. Cooperation of the residents would help the management in achieving this aim. BOB is a leading Public Sector Bank. Manipal Group is the national leader in the field of education. Therefore, it is imperative that all members of Baroda Manipal School of Banking maintain the image of the School as the premier professional organization and adhere to the Code of Conduct that is expected from the participants. It is incumbent upon all to maintain consistent standards of personal conduct. 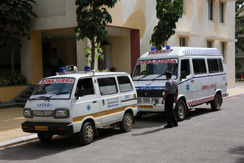 The participants would be expected to maintain proper decorum both in the academic block and in the hostel. They would also be required to behave in a responsible manner when they are outside the school. Suitable instructions on various issues would be passed on to the participants from time to time by posting these on BMSB website or on the BMSB notice boards. All participants are advised to read these notices regularly. It would be assumed that all participants have read these notices once these notices have been put up on the websites / notice board and have been there for 6 hours. Some important points for compliance on issues of general nature are enumerated in the succeeding paragraphs. Consumption of Alcoholic beverages, cigarettes, tobacco in any form and chewing gum is strictly prohibited in the Campus and also in the Hostel. Participants are also not permitted to come to the hotel after consuming alcohol from outside. Fireworks are not permitted in the campus or the hostel. Holi colours are not permitted inside any building. Holi will be celebrated only in open spaces nominated by the authorities. Possession, consumption and offering of narcotic drugs in any form is totally prohibited. Any violation will invite severe disciplinary action. Stealing or unauthorized possession of items belonging to any other person would be viewed seriously. Possession, accessing it over the internet or displaying of any pornographic material in any form will invite severe disciplinary action. Mobile telephones are not permitted inside the academic blocks. No private conveyance like motorcycle/scooter/car, etc is permitted in the School. Programme participants are expected to be punctual for classes and all other organized activities by the School. Formal office trousers and shirts with a tie. Most acceptable colours for trousers would be black, brown, blue and grey. Preferable pastel colours for shirts. Formal western wears (formal trousers/skirts with a top or a jacket) or salwar kameez. There will be separate wardens for the gentlemens and the ladies hostels. The wardens would be responsible for the discipline in the hostel and for allotment of the rooms. The concerned Warden heads the Hostel Management Committee. The wardens will be assisted by hostel supervisors and other staff who will be responsible for maintenance of the buildings and other assets. In addition, floors in charge would be nominated to join the management Committee who will assist the wardens in the day to day functioning of the hostels. Similarly, a Mess Committee would be formed to assist the warden in smooth running of the hostel mess. Aim of setting up the management committee is to ensure a clean and secure living environment that is conducive for the academic advancement. Gentlemen are not permitted to visit the floors of the hostels earmarked for the Ladies. Similarly, ladies are not permitted to visit the Gentlemens rooms or the floors occupied by them. Rooms would be allotted to the residents by the warden. The allotment would be valid for the complete duration of the Programme. Residents shall not change over to any other room except with the written permission of the warden. Residents may be required to shift to other blocks/rooms in organizational interest, as and when directed by the hostel authorities. Residents are advised to check all fixtures and fitments in their respective rooms as per the inventory at the time of occupation. Residents would be required to vacate the hostel after successful completion of the 3rd trimester on receiving appointment in the Bank. Any damage to the hostel property in their respective rooms would have to be made good by the Residents. Residents must tidy up their rooms every day before leaving for classes or going out of the hostel. Any request for repair or maintenance should be entered in the registers specifically kept for this purpose with the hostel warden. Residents must bring to the notice of the supervisory staff any failure or breakdown in electric supply. They should not attempt to repair the defects in the mains or in the distribution system. When leaving their rooms, the residents must switch off all lights, fans and water taps. Bed linen would be changed at stipulated intervals by the supervisory staff. The rooms and surroundings must be kept neat and clean. Services of cleaners would be provided by the hostel. Pets of any kind are not permitted in the hostel premises. Feeding of stray dogs and cats or any other animals is not permitted in the hostel premises. All residents would be necessarily required to dine in the Residents Mess. They would be expected to adhere to the laid down timings. Playing of loud music and disturbing other residents is not permitted. All residents are expected to maintain the decorum by not disturbing their roommates or their neighbours. Playing of any outdoor games in the corridors of the hostels is not permitted. The Wardens or their representatives may enter any room for verification at any time of the day or night. All residents must return to the hostel latest by 7.30 pm (girls) / 10 pm (boys). Any absence from the hostel at night must be with the specific permission of the warden. Residents are not permitted to allow their rooms to be used by any other person. Visitors must be entertained in the areas specifically earmarked for them. No television is permitted to be kept in any hostel room. Residents are advised not to keep any valuables or jewellery, etc in their rooms. All expensive items must be kept under lock and key when the residents are not in their rooms. The management will not be held responsible for loss of any valuables. All rooms when the residents are not present must be locked and the key handed over to the security by the last occupant leaving the room. Residents are not permitted to bring any type of private conveyance to the hostel. All complaints shall be made in writing and addressed to the warden. Residents are not permitted to convene meeting of any sort in the hostel premises without the prior permission of the warden. These instructions are by no means comprehensive. All Students admitted to the course are provided with a Participant Handbook and a copy of the discipline rules & regulations, which they have to abide by at all times during the programme. Any issue, not expressly provided herein, would rest at the absolute discretion of the BMSB authorities who also reserve the right to modify these instructions. It would be the earnest endeavour of the management to make the living conditions in the hostel as comfortable as possible. Cooperation of the residents would help the management in achieving this aim. Baroda Manipal School of Banking is located in the northern part of Bangalore on the main road leading to the airport at Devenhalli. Bangalore is the capital and the largest city of the Indian state of Karnataka. It is also called "Garden City" for its beautiful gardens, flowers and trees which flourish in each and every street. It is India's fifth largest city and India's fifth largest metropolitan area, with a 2001 population of about 96.21 lakhs. Bangalore, also known as the “Science City or Cyber City” of India has become an education hub for students from both India and abroad. The educational institutions here have excelled in the deliverance of high-standard education in various disciplines to enable students prepare for a highly competitive working environment. Bangalore has been able to achieve a high literacy rate of 83.91% with the help of several initiatives taken by the State Government and the local authorities. Nature has gifted Bangalore city with a very pleasant and moderate climate. In Bangalore, neither would you tremble with cold in winters, nor would you drench with sweat in summers. Bangalore weather boasts of cool winters and warm summers, without any extremes in both the cases. The monsoon season in Bangalore is from June to August. The south-western monsoon rains drenches the city in monsoons, taking the humidity to as high as 76 percent. The city of Bangalore counts amongst the few cities in India that experience an agreeable weather throughout the year. Still, the best time to visit the garden city of India is between October and February. Detailed communication would be sent to the finally selected participants in due course, which shall also include details of arrangements, etc to reach the Campus. Programme Participants may plan their journey to arrive at the campus on the dates indicated in the bank's communication. The Route Map will be uploaded shortly. 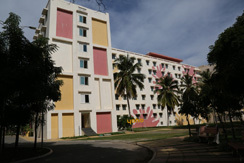 Accommodation for the participants is provided in the hostels located in the campus. Room allotment is done on 'first come first serve' basis. 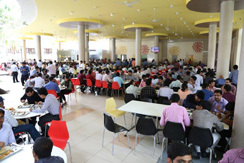 A separate dining room has been provided for all the students. The campus is full -fledged with self- sufficient facilities for knowledge acquisition. Baroda Manipal School of Banking has an air conditioned library with a large collection of books & reference material, magazines & journals and large number of economic and general newspapers. It is open on all days till late in the evening. Text books are supplied to all new students on returnable basis. Reference books can be browsed in the library and can also be borrowed. There are interesting teaser schemes to induce & promote reading habits such as free newspapers, additional books for borrowings etc in select hours. Baroda Manipal School of Banking has well equipped computer labs open up to 8.30pm every day of the week. The number of desktops/Laptops available to students is very large enabling a student: machine ratio of around 3:1. The campus has a high broadband connectivity enabling uninterrupted access to global knowledge. From 19th batch onwards the course will be consist of a -9- (nine) months of on campus residential program at the Baroda Manipal School of Banking leading to award of a Post Graduate Certificate in Banking & Finance by Manipal University. On successful completion of the Post Graduate Certificate course, the candidate would be offered appointment in the bank as PO in JMG/S-I. Immediately after joining, a 3 (three) months Work Integrated Learning (WIL) in the form of On the Job Training at any branch of Bank of Baroda will be carried out which will lead to award of a Post-Graduate Diploma in Banking & Finance by Manipal university. The course is extendable to a further 18 months of blended learning which is optional at the option of the students and which will lead to award of MBA in Banking and Finance from Manipal University. On successful completion of the Post Graduate Certificate in Banking and Finance, the candidate would be offered appointment in the Bank as PO in JMG/S-I which is presently in the scale of pay Rs. 23700-980x7/30560-1145x2/32850-1310x7/42020. They will also be eligible for DA, HRA / Rent Reimbursement & CCA as per rules from time to time. At present, the initial annual CTC is approximately Rs 8 lacs (including perquisites) in a Metropolitan Centres. The above mentioned various salary / perquisites, benefits, etc. may increase in future, by time to time the candidates join the services of the Bank. The fees amount of Rs. 3.45 Lacs will be refunded on completion of -5- years of service with the Bank. This is applicable for the students from 13th batch onwards, after September 2014. Hence, on completion of -60- months of service with the Bank of Baroda, the Bank will reimburse the course fees. Upon absorption in the Bank as Probationary officers in JMG/S-I on successful completion of their course, candidates shall be deployed in Branches / offices on an All India basis. However, the Bank shall take into consideration special skills acquired by any candidate, past experience, caliber of any employee for any particular stream as demonstrated during the course of the programme into consideration while making the deployment decision. The choice of branches / offices of the Bank will be as per the needs and business requirements of the Bank. The Bank shall also take into account the place of domicile of the candidates though this aspect shall not be a reason for definite posting in any place and the bank cannot guarantee placements as per the place of domicile of the candidates. Specialization in a functional area is decided by the Bank based on the prevailing needs and business requirements. However, all the officers who have passed out from the Baroda Manipal school of Banking, by virtue of their special one year training and background shall definitely be placed in important, critical and challenging assignments across the Bank. 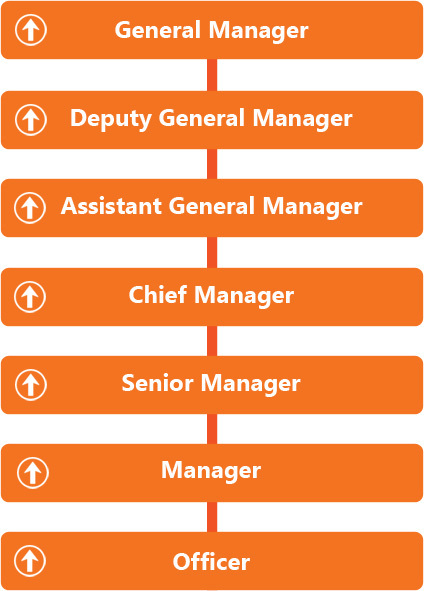 Bank of Baroda offers one of the fastest career progression opportunities to deserving officers and an officer in JMG/S-I can rise upto the level of a General Manager, subject however to his/ her being deserving and having potential for the higher position.